Situated just 300 metres from the private stretch of the Colva-Varca Beach, Colonia Jose Menino features an outdoor swimming pool and rooms with free Wi-Fi access. It also has a poolside bar and restaurant. 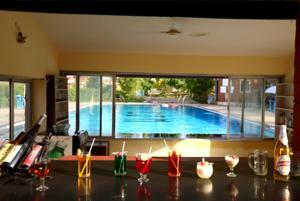 Colonia Jose Menino Resort is a 20-minute drive from Margao bus and railway stations. Dabolim Airport is 37 km away. Fitted with a balcony, rooms are cooled with either air conditioning or a fan. They offer cable TV and an en suite bathroom. A minibar is included. Recreational options include outdoor sports like volleyball and tennis, or indoor games such as carom and ping pong. Staff at the resort’s 24-hour front desk can assist with airport shuttle, luggage storage or tour laundry services. Facilities also include a conference hall and a tour desk. Free! All children under 5 years stay free of charge when using existing beds. One older child or adult is charged INR 500 per night and person in an extra bed. Maximum capacity of extra beds in a room is 1. There is no capacity for cots in the room. Any type of extra bed or child's cot/crib is upon request and needs to be confirmed by the hotel. Supplements will not be calculated automatically in the total costs and have to be paid separately in the hotel.